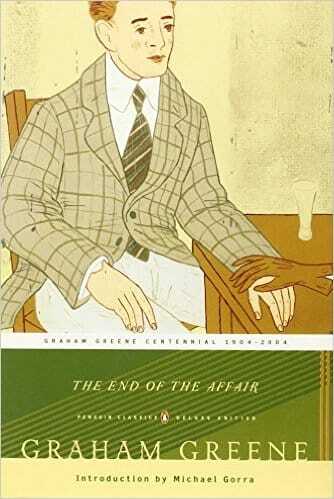 Graham Greene’s End of the Affair is difficult to digest, equal parts claustrophobic and imaginative. Set in wartime England, Greene’s novel is defined by wartime frankness that reminds me of Hemingway. At the same time, End of the Affair is intensely personal and emotional, conveying a tone that Hemingway never attempted. It’s a lesser-known piece of British literature that’s well worth some exploration. End of the Affair keeps a very tight view on two main characters. Maurice Bendrix is a failing writer who is searching for meaning in his life. He finds passion and devotion in a beautiful woman named Sarah Miles, who he meets by chance and pursues through secret encounters. Sarah’s husband, Henry, has resigned himself to her dalliances and is oblivious of their affair. As the title foreshadows, End of the Affair tells the story of Sarah and Bendrix’s love affair. Pressured by the war, Sarah and Bendrix find themselves planning a future that they can never inhabit. The book pulls us through their agonizing personal thoughts of doubt, faith, love, and jealousy, finally separating them forever. Don’t take from the subject matter that this is a chick flick or a romance novel. Green’s writing style is gripping and he wrestles with Bendrix and Sarah’s deepest thoughts. Though Bendrix narrates the entire novel, many long passages are taken from Sarah’s journal, giving us an intimate look at both main characters. Green’s characters are what remind me so vividly of Hemingway, mainly The Sun Also Rises and A Farewell to Arms: Sarah is vivacious, full of life, yet impulsive and rash. Bendrix, on the other hand, is cautious and subdued by comparison. Greene plumbs the depths of faith, and his Catholic background shines through brightly in this novel. Though the Catholic faith provides answers to many of the questions Bendrix and Sarah ask, the value comes from following them and their wrestling throughout the book. God is a mysterious presence in End of the Affair. Bendrix acknowledges God, yet hates him in his worst moments. When Bendrix is seemingly snatched from Sarah, she finds herself searching for answers in the Catholic church. Unlike Hemingway’s Lost Generation, Bendrix and Sarah are set just after the Greatest War, and though their story is dominated by sin and darkness, it is punctuated by hope and faith. The End of the Affair is a classic that’s well worth the read. Greene’s subject matter calls for adult discernment, in my view, but this is not a shocking or voyeuristic book. Instead, it’s the emotion and faith behind the actions that make this a classic. Based off his own life and his own affair with “C,” Graham Greene has written a 20th century classic in End of the Affair.